Table top brush panels, or otherwise known as panel brushes, are often used to support flat surfaces by using many brush fibers that prevent damage to delicate surfaces. 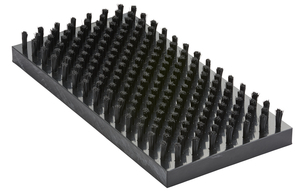 These brushes are widely used in sheet metal fabrication, glass panel conveying, wood finishing, or any application where surface finish is a high priority. The variety of dimensions we offer; allow for shorter and harder brush fibers to be used if heavier material is being transported. With a variety of manufacturing capabilities, Tanis Inc. is able to offer custom engineered solutions to many different industries.